Lately I am getting a lot of emails asking how to get money ~ and asking "Is it ok to chant for money? First I would would like to say to chant for exactly what you want. If you need money chant for money~! You deserve to have what you need. There are many, many examples of people chanting for money and getting it. I chanted for 5K and got it immediately. But underlying the need for money there is a deeper and more exciting benefit that we can access within our lives. We can access and build TRUE FORTUNE into our lives. What is FORTUNE? How do we build it for ourselves? First of all, fortune is self made. No matter what our levels of fortune may be before we begin practicing Buddhism, once we begin intoning the name of the Law of Cause and Effect, the Mystic Law itself, Nam-myoho-renge-kyo, our lives begin to move in the direction of fortune. 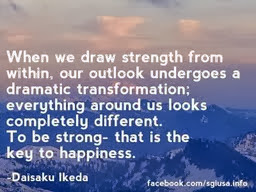 With our Daimoku (chanting) we begin "changing from the inside out", the ONLY way to affect true and lasting change. And with each passing day of chanting, studying, encouraging others and introducing people to this practice our fortune grows and grows. Fortune is being in rhythm so that we KNOW what to do, and have the spirit, conviction and courage to make the best possible causes at all times! Fortune is being in the right place at the right time. Fortune is Happiness and the ability to overcome any suffering and turn poison into medicine. Fortune is strength and resiliency. Fortune is getting a call from an associate about a job opportunity that happens to be perfect for you. Fortune is having the courage and wisdom to say what must be said and do what must be done at the crucial moment. I had one of these crucial moments yesterday and I trusted myself to take the correct action and I'm really satisfied that I did the right thing... the absolute right action. buddhist wisdom in action. That's fortune. Fortune is always having what you need when you need it. Fortune is having the time to chant to our heart's content and encourage others, too. Fortune is being able to join harmoniously with our fellow SGI members creating a new kind of family for us all. Fortune is being born at the same time as Daisaku Ikeda and learning how to engrave the mentor disciple relationship into our lives so that it is a living, powerful source of energy and wisdom in our lives. Fortune is the finding solace and peace even when we have lost a loved one. Fortune is experiencing the true depth of friendship... knowing how to be a friend, attracting, keeping and appreciating quality people in our lives. Fortune is experiencing how to love and be loved in return. Fortune is the freedom to live our lives as we want...traveling freely and happily. Fortune is the ability to laugh. Fortune is the ability to sit in front or our Gohonzons and cary out a meaningful dialogue within our own lives that makes the impossible possible,and brings happiness to ourselves and our families, friends and world. Fortune is seeing that advertisement for exactly what we need when we need it. A few years ago I kick started my 70 pound weight loss by turning on the TV and seeing a weight loss program being advertised that I ordered and really worked for me. Another time I googled "Agents looking for authors" and found out about a Writer's Digest Conference in New York. A week later I was on a plane to a conference that really forwarded my writing career. How do we build fortune for ourselves? 1. First we must build a strong practice. "I will WIN because my life is important. I will use my life as a shining example that this practice works!! My winning will be a real "win/win" because I will inspire others to the greatness of their own lives! I will win for kosen-rufu. I will win over my own negativity. I will absolutely do this!" 2. Determine and believe we DESERVE what we want fuels our fortune. Every action we take all day long is a cause for our happiness. What do we want? Why do we want it? What can we do to fuel that desire? When I was 70 pounds heavier I wrote all the reasons I wanted to be thin. And I read that list all the time. I still have it. I found pictures of how I wanted to look, and I looked at them frequently. I visualized walking into a store and being able to buy any clothes I wanted! I fueled my determination. I fueled the conviction that losing weight was possible for me because I chant, and all my past failures just didn't count. Hon Nim Myo - "from this moment forth". Every time we chant we begin life anew. From this moment forth I will win. From this moment forth is EVERY MOMENT. We have the power to change. NOW. We chant the MYSTIC LAW underlying all of life. Wow. We are filled with fortune! 3. Chant for what we want, and Chant for STRENGTH of practice and strength of mind and heart! If we want money, we chant for money. If we want to NEVER WORRY ABOUT MONEY AGAIN - we chant with this in mind. If we want a job we chant for it. The world is OURS. We chant for exactly what we want! What does fortune mean for you? Write me at chantforhappiness@gmail.com with your experiences and comments! The more "work" we put into building our practice...the less "work" we have to put into our lives...the less struggling we have to do. Chant for what we want, and Chant for STRENGTH of practice and strength of mind and heart! Question about chanting: Does one have to chant for one straight hour or can that be broken up in segments (30 minutes in the morning and 30 in the evening)? You don't have to do the full Hour at one time. You can break it up the way you asked. I've known people to chant for 10 to 15 minutes, take a break, and do the same thing throughout the day when they were doing their Daimoku Tozo. You decide when and how much/long. If you want to dedicate more time to doing Daimoku, then, whenever you chant, chant to be able to chant longer. The time does not matter. Time is yours for the taking or making. YOU DECIDE! Yes, you can always break up your chant session in segments. Sometimes, I may do 4 x 15 minutes sessions a day if it better fits my schedule, other days, when I am strong and determined and have more time on my hands, I may chant 2 x 2 hours. Hi Jamie, Thank you for posting this. This post helped out a lot. Like I told you, finding your blog was a great benefit for me. Hii surbhi. Yes you can do your gongyo at 3am. In fact from 2 am to 4 am. Buddha do there gongyoand its very important time . Thank you Jamie. Loved Reading about Fortune. . Fortune as you say is being in rhythm so that we know what to do, and have the spirit conviction and courage to make the best possible causes at all times. I will treasure a copy of this in my file and read it very often. Thank you once again. It's the Holiday Season Here! The Great Buddha Is Reading this Blog Right Now! Do You REALLY Believe You are the Great Buddha? PowerPrayer for Overcoming Anything !